Update: The game has been patched, so the binaries in the release will no longer work. I’m not going to keep this up to date, you can find another snap to grid mod on the Weather Factory reddit if you still want one. 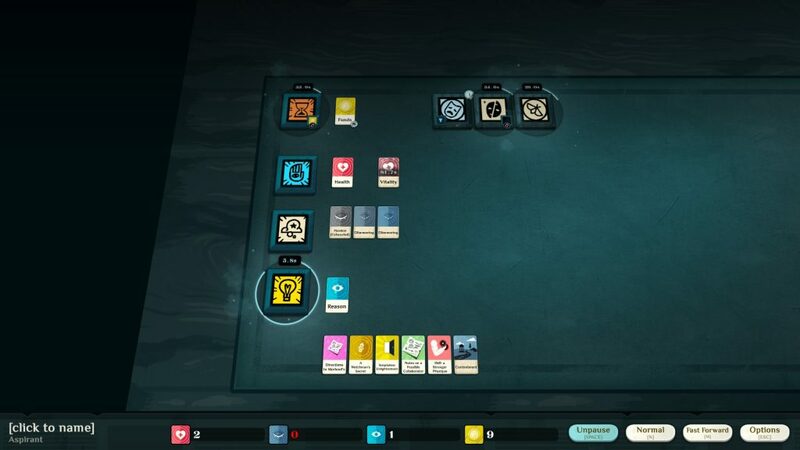 Cultist Simulator released a few days ago, and it’s quite fun! Something I was missing was the ability to snap cards and verbs to a grid to organize things a bit easier. So, since the game is made in Unity, I did some quick hacking using a tool somebody made for Hearthstone originally and added it in. Cards and verbs will automatically snap to a grid appropriate for their size when you release them. If you don’t want them to snap to grid, you can simply hold down Control when releasing it and it’ll stay where it is. Tapping A will snap all cards to the grid if things get out of hand. I also added in a Super Fast Forward speed which makes the game run at 15x normal speed, so starting new characters is much much faster. You can press Comma (,) to instantly turn on Super Fast Forward, or click the Fast Forward button twice so that it turns red. Weather Factory, if you don’t want this out there then send me an email and I’ll take it down right away. Source code for it is available on Github. Extract the cultistsimulator_Data folder into your Cultist Simulator steam folder (e.g. E:\steam\steamapps\common\Cultist Simulator\), and override any files. If the game gets updated, the prepackaged dll’s will be out of date. You can patch the new ones by changing the path in the PatchCultistSim batch file and running it. If you want to uninstall the mod, uninstall and redownload the game, it’s small enough. If you don’t want to do that, then go into cultistsimulator_Data\Managed\, delete Assembly-CSharp.dll and rename Assembly-CSharp.original.dll to Assembly-CSharp.dll.